It has become common practice for Rotary clubs around the world to Recognise VOCATIONAL EXCELLENCE of the highest order (especially in January which in Rotary's Vocational Service Month), and to honour outstanding contributions by individuals or teams of individuals for significant advancement in their vocational fields and service to their communities, In doing so they exemplify the Rotary model of “Service above Self.” This is then recognised by Rotary’s Vocational Service Awards. These outstanding contributions also set an example to others, particularly the youth to strive for Vocational Excellence. 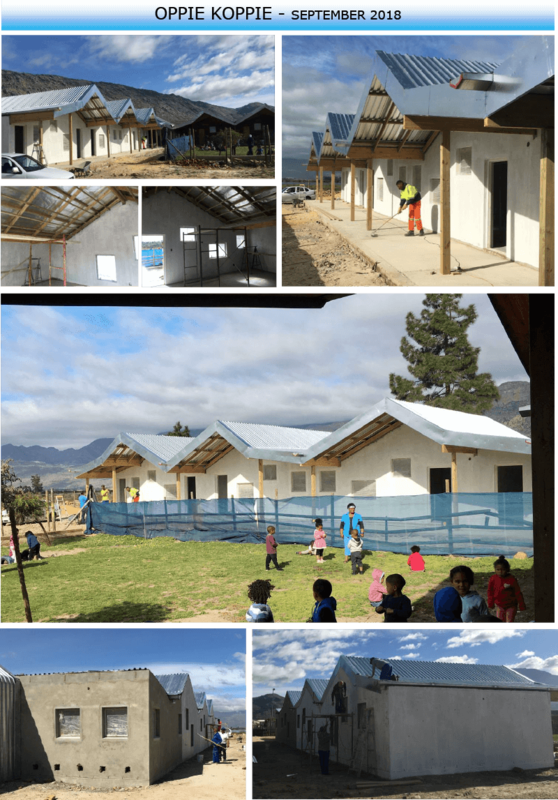 We recently featured a project partnership between the Rotary clubs of Pinelands and Newlands based in Prince Albert Hamlet. 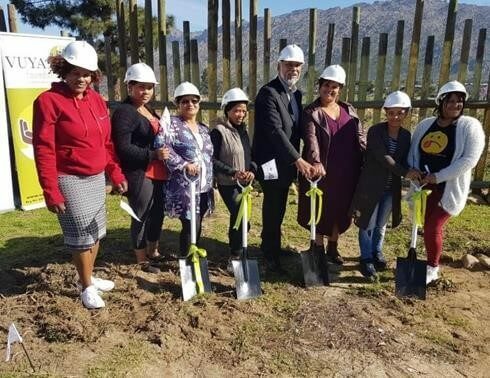 The clubs have taken on the massive task of expanding the facility to meet the demand for great childcare and early childhood development in what is a rural and low-income area. Below are pictures of the project from the end of September. Despite wet and rainy weather, building is ahead of schedule and the facility is set to open on 16 November 2018. Another incredible project to be proud of! 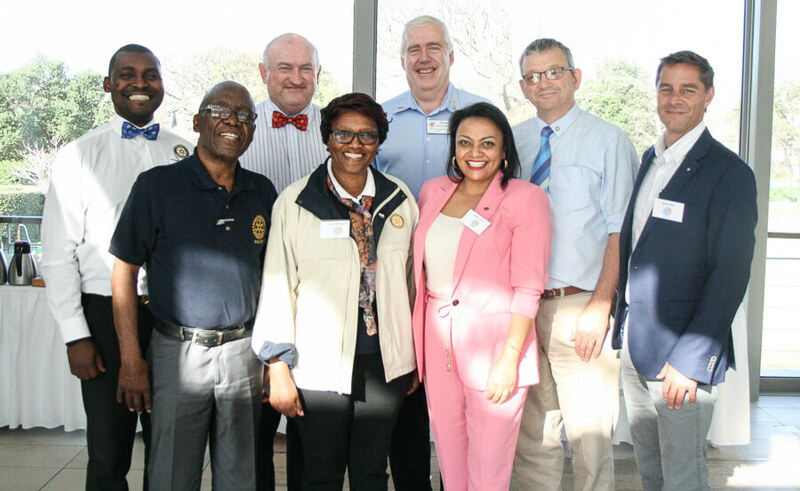 “How to reach your Rotary potential and add value to your club” was the focus of this interactive seminar held on Saturday, 28 July 2018 at the Intaka Island Eco Activity Centre, Century City, Cape Town. Well attended by 33 “newbies” and “oldies” from 12 clubs, the seminar appeared to hit the mark. 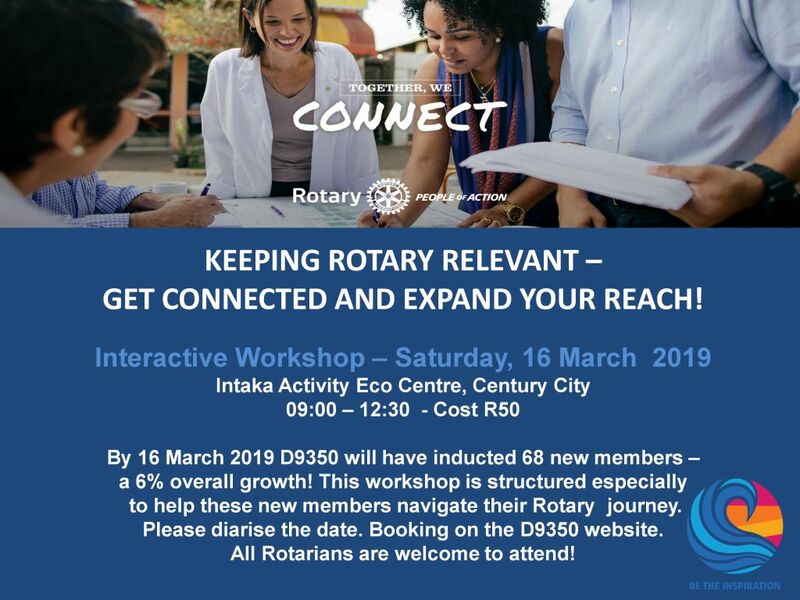 The remark by Tsie Mogiogie of Claremont Rotary made my day - “wish that I could have attended a seminar like this five years ago when I first joined Rotary”. 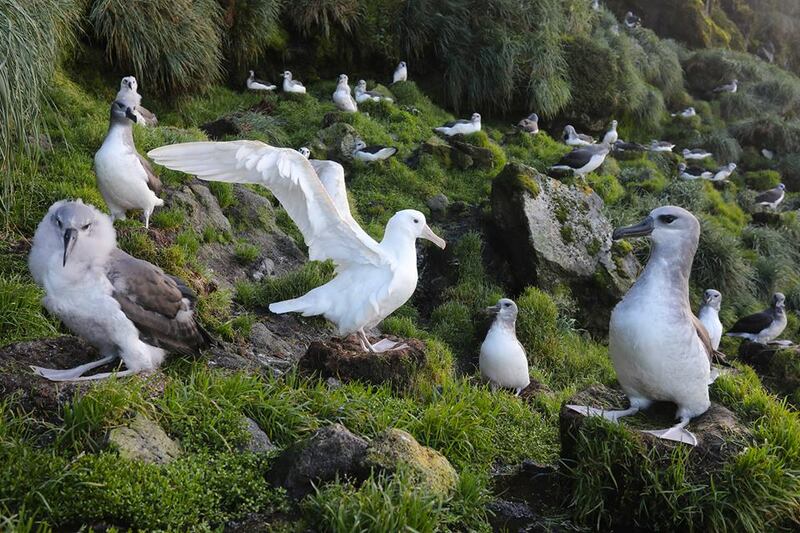 Due to popular demand, another “newbies” seminar is planned for early next calendar year. Sincere thanks to our team who presented so professionally. A strategy session facilitated by Peter Thomas, coordinated by Rotary Coordinator (South) Andrew Jaeger held at Kelvin Grove Club on Saturday, 21 July was a resounding success. Attended by a diverse group of 35 Rotarians and Rotaractors from five countries, three districts, it certainly hit the mark in content to achieve an excellent diversity and growth outcome for Zone 20A. DG Casper will share the content of the final report with clubs. We are excited to take these recommendations forward! 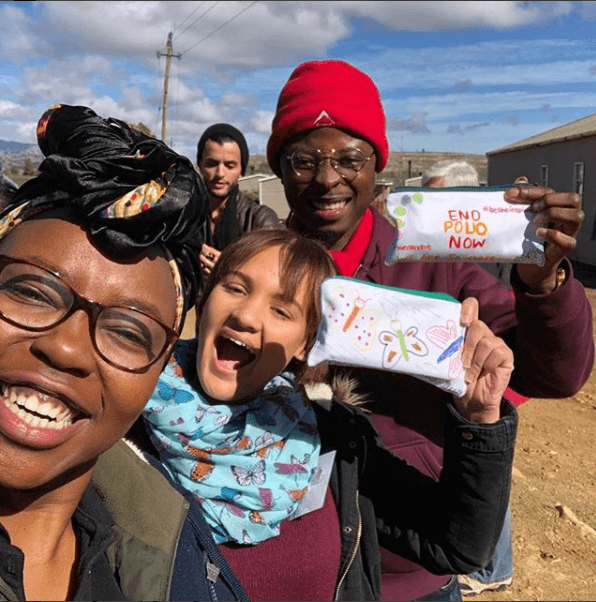 Wynberg Rotaract hosted the recent Rotaract Conference and chose to make personalised pencil bags filled with stationery for a local school. Our Rotaract Clubs enjoy hands on service projects and had loads of fun turning plain white pencil cases into unique works of art! We forget how a simple set of stationery can make all the difference to a child's day at school and he/her ability to truly engage in their schoolwork. 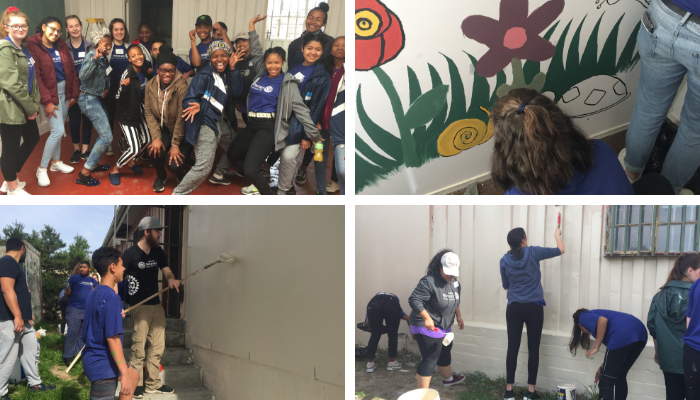 The Wynberg Rotaractors look forward to reaching more children in the furture with the assistance of Rotary Clubs across the District. 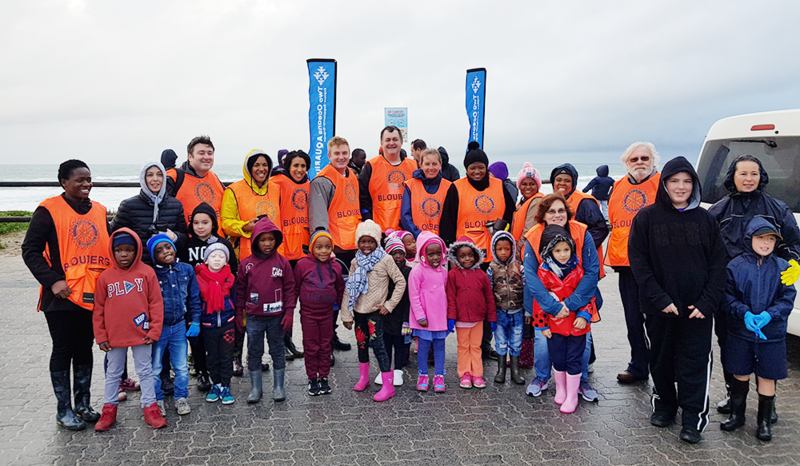 Hundreds of people braved the 14-degrees cold water and got "freezin' for a reason" at Victoria Bay on Saturday 28 July. Young and old enjoyed the festivities on the beach at the third annual dotsure.co.za Polar Bear Plunge. Garden Route businesses challenged each other to brave the cold for a chance to win R20 000 for a charity of their choice, and locals offered their support by donating blankets as an entrance fee to partake in the day. George Rotarians were out in force and manned the refreshment tent dispensing 500 hot beverages and biscuits to those brave enough to take the plunge, and for their efforts, Rotary received their share of some 750 blankets which they promptly re-donated to the George child and family welfare clinic. The Rotary club of Pinelands assisted the Oppie Koppie Crèche with tables and chairs for the learners in 2010. Since then, the Crèche has been oversubscribed for some time and needed to extend the building to cater for more children from this growing community. 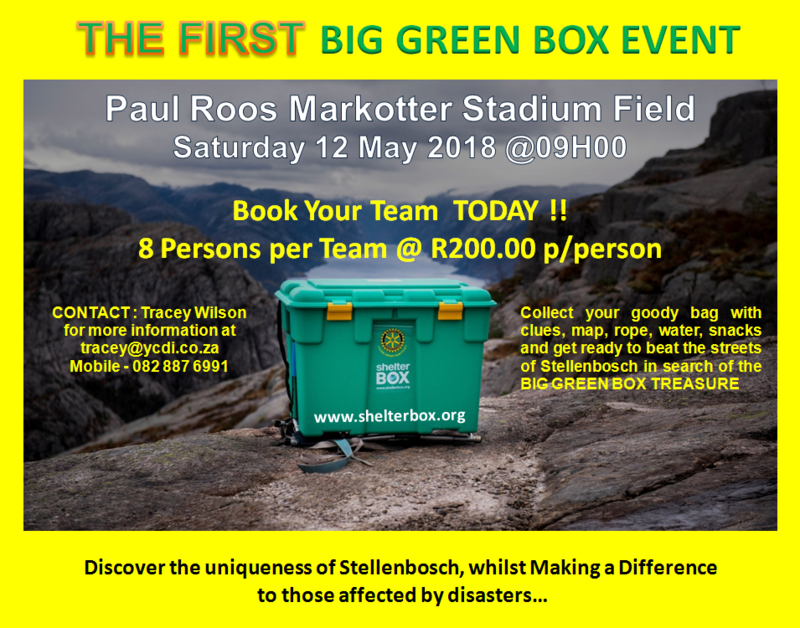 The Club answered the call for help and has since collaborated with the Rotary Club of Newlands and the Vuya Foundation to supply local children with the educational faclities they need. 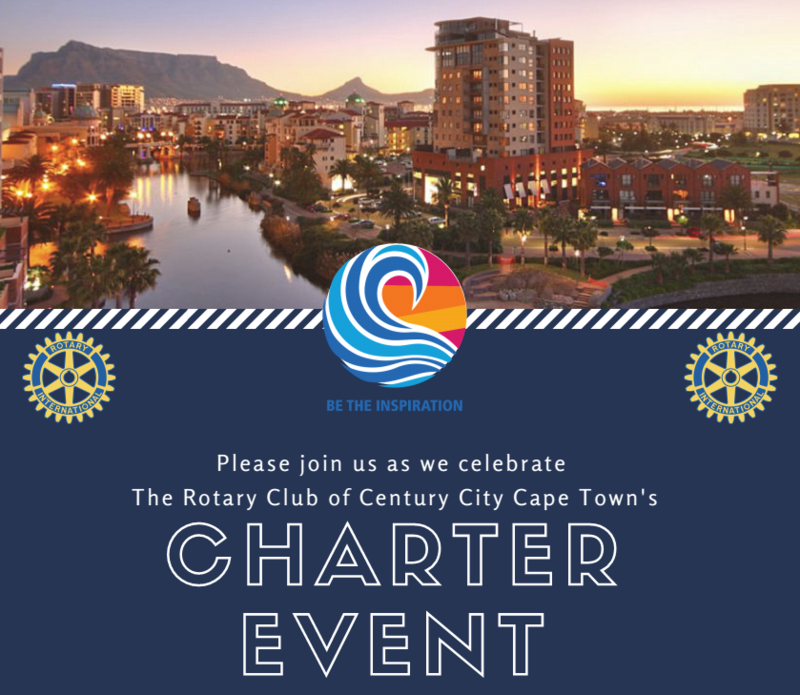 After a labour of some 14 years, your Future Pillar chair June Webber had the honour of inducting Anthony Martin Lawrence as Charter President at the charter event of the RC of Century City, Cape Town. A stellar event attended by some 150 Rotarians and friends from five countries. 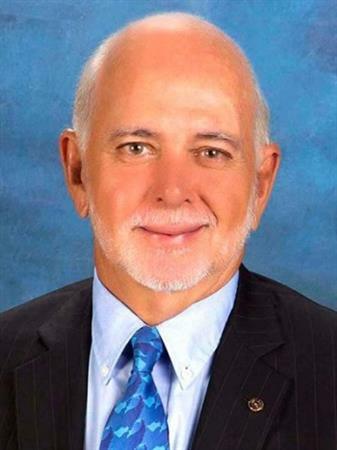 Almost 50% of the clubs in the district attended, including RI Membership Director Brian King who stressed that Rotary “was a membership organization and not a service organization”. Chartered on 18 July 2018, Nelson Mandela’s birthday – the club will always be blessed with Mandela Magic. 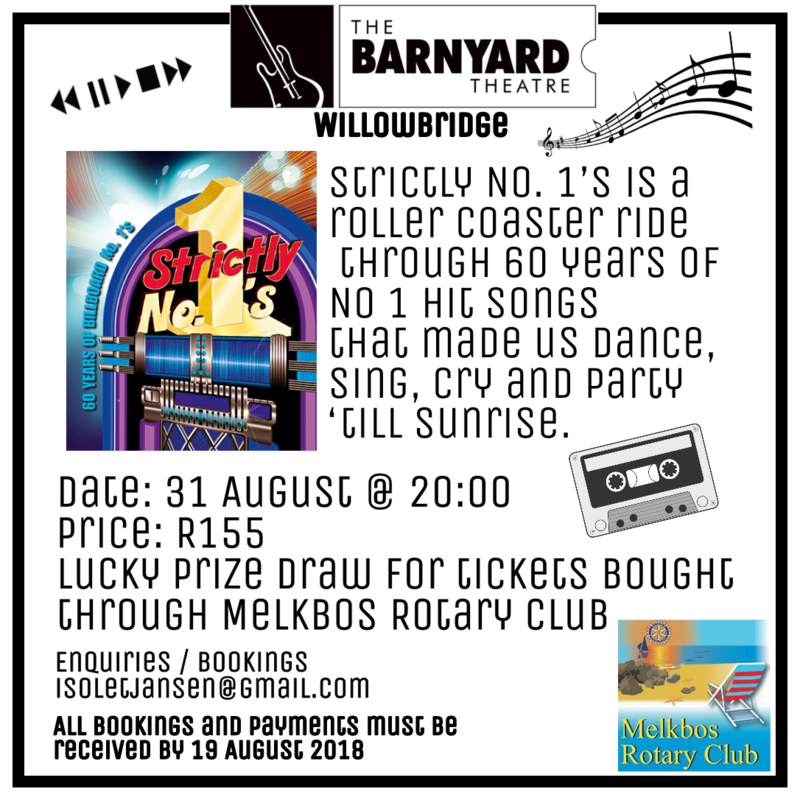 ROCK YOUR SOCKS OFF WITH MELKBOS ROTARY! 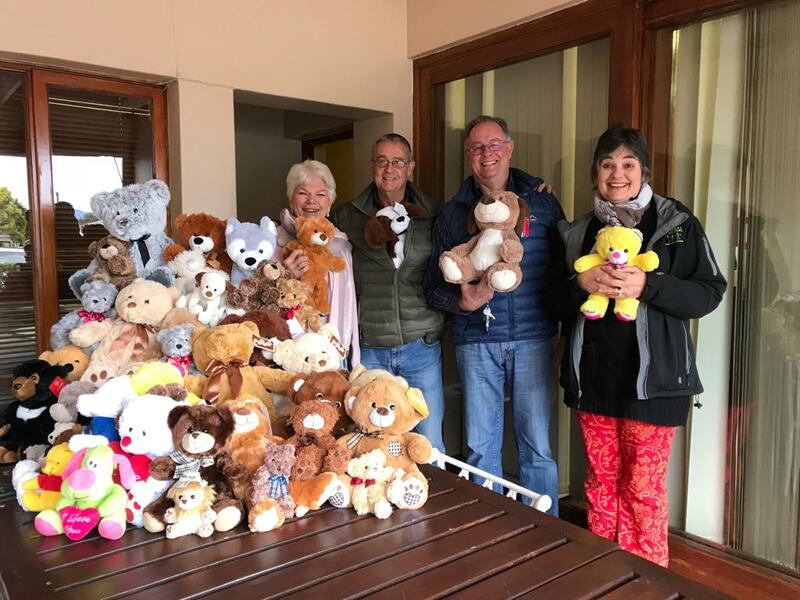 George Rotary Club’s recent Presidents induction Lunch was an Induction with a difference, the theme was ‘A Teddy Bears Picnic’; each Rotarian was requested to bring a soft teddy toy to be donated to a local trauma Clinic. 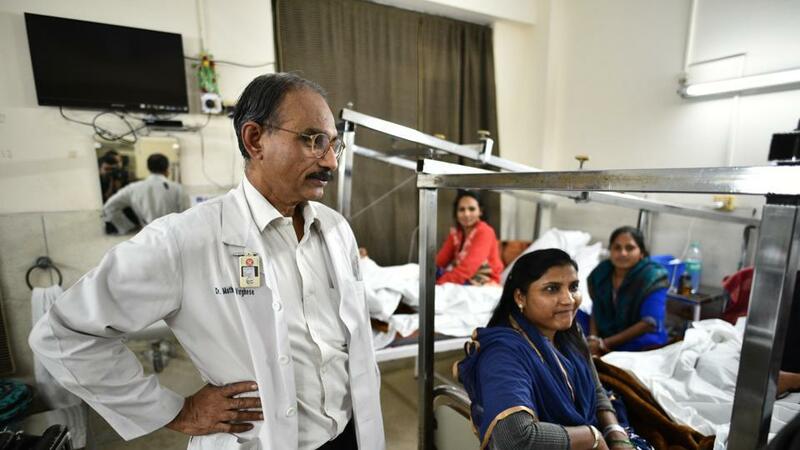 The Rotary Family Health Days (RFHD) team have recently released an impressive impact report which provides exceptionally important information on who attended the RFHD, why they attended and how they heard about this initiative. Based on the survey data (which is confirmed as statistically reliable by the methodology), far more women visit RFHD than men. The largest number of clients fall between the ages of 20 - 49. It is encouraging to see that 74% of respondents reported that they had regular access to free healthcare. Of the respondents that said they have difficulty accessing healthcare (7%), or had no access at all (9%), the reasons for limited access comes down to three main reasons: travel distance and cost to clinics, waiting times at clinics (they sometimes have to take a whole day off work) and poor clinic service & staff attitude. 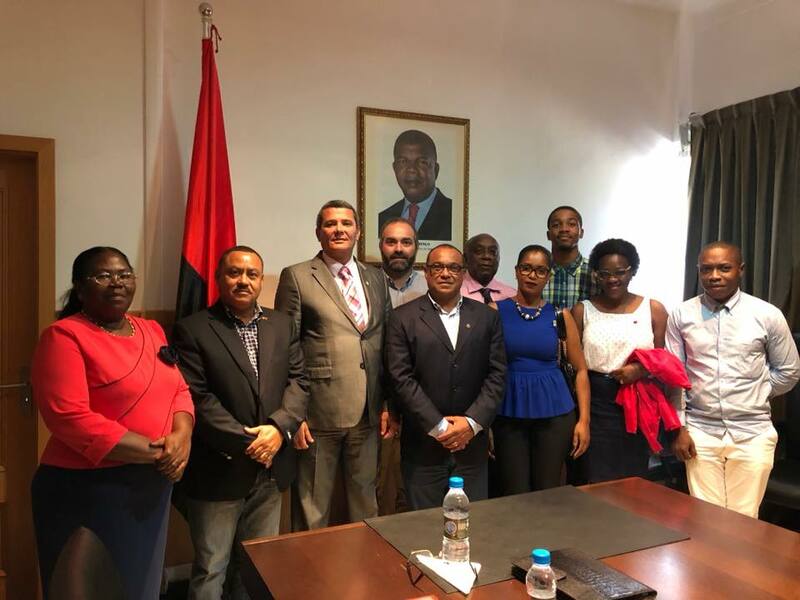 On January 25, 2018, the representative members of the Lobito Rotary Club and a representative of the Lobito Rotaract Club Provisional Core had the privilege of being received in audience by His Excellency the Provincial Governor of Benguela Dr Rui Falcão. The Rotary Club of Lobito through its then president Jorge Crisóstomo, gave a brief explanation of Rotary, its objectives and areas of action as a Club providing community services. To help create awareness and support for the global effort to protect all children from polio, Rotary’s international convention featured two virtual reality videos that immersed viewers into the lives of those still impacted by the disease, and what it will take to eradicate it worldwide. Download the Rotary VR app in Google Play or the Apple App Store to view “I Dream of an Empty Ward." You will need a VR headset (it's easy to make one at home using these instructions here) as well as headphones and a wifi connection. If you don't have the equipment to watch it in VR, you can still view the 360-degree video here. The Kirstenbosch RC recently hosted an Expo of Musical talent with an Entrepreneurial emphasis at Pollsmoor Prison. 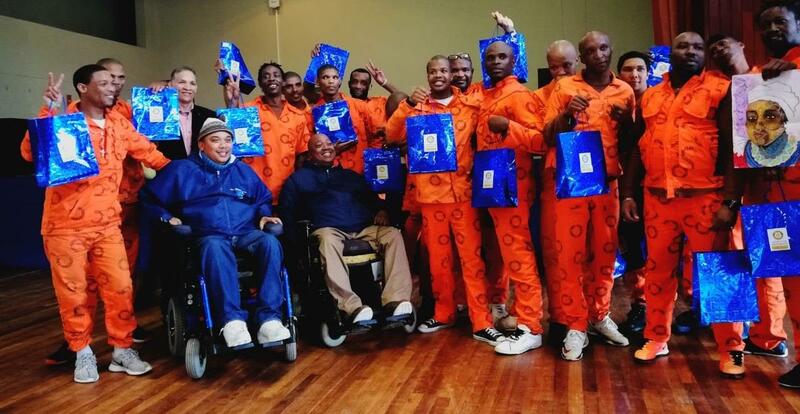 The Cape Town Male Voice Choir and the Dept of Correctional Services (DCS) choirs sang to the accompaniment of an acoustic piano and band. President of Kirstenbosch, Jeromé o' Ryan also arranged for the ex-detainees to offer crafts & refreshment items for sale as a learning opportunity to earn some money. Member of the DCS choir members each received a goodie bag, as did the Foot and Mouth Painters who were in attendance as well. This amazing project, held in the Recreational hall at the prison, was a humbling eye-opener and is an event l believe should be repeated and supported by all! 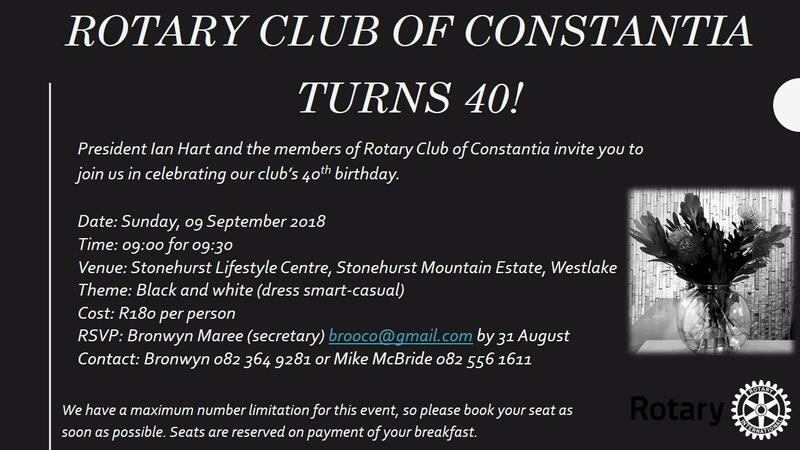 The most exciting news for this month must certainly be the chartering of our new Century City club on 21 July. The charter members recently hosted a beach clean up at Sunset Beach to celebrate World Oceans Day. 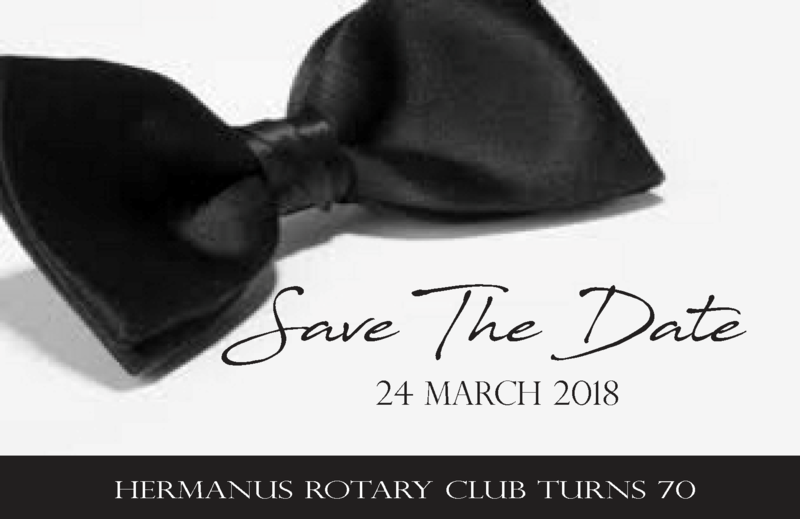 You can support our newest club by linking their Facebook page here or please join us as we celebrate their Charter Event – 18:30 for 19:00 at the Oasis Club House, Oasis Lane, Century City. Dress is formal. 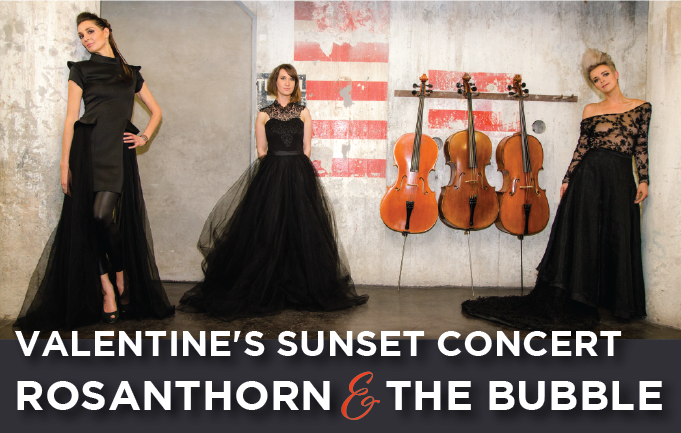 R175.00 pp includes a three-course meal. This will be a plastic-free event, not to be missed! Email Carmen Crouser cccrouser@gmail.com soonest to book your seat. As the 2017-18 Rotary Year draws to a close RI Pres. Ian Riseley's Challenge to Plant Trees has been met by many Rotarians who share his concern for the Environment. To thank those who have participated, his Message of Thanks has been broadcast by Rotary International. 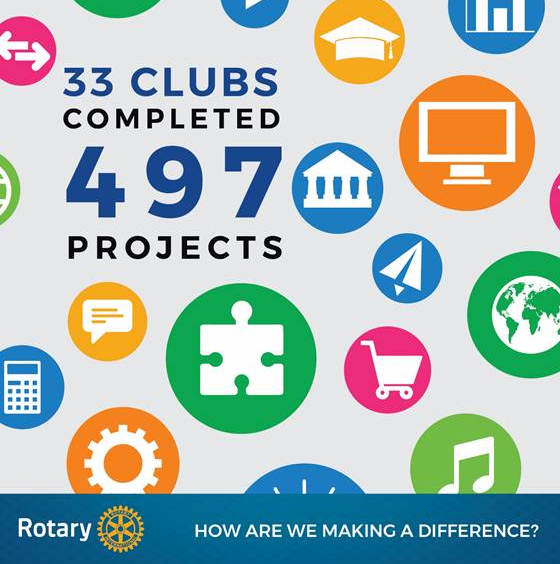 The District Data Project provided the tool to collate project activity so that a meaningful review of Rotary's work can be shared not just with Rotarians but with our many partners; from Government to non-profit and individuals to corporates. The numbers we've gathered make great reading. Follow the daily posts at www.facebook.com/RotaryD9350/ and please do get Rotarians in your Club to 'like' the page. If they are long-time fans please them to check that they've 'followed'. 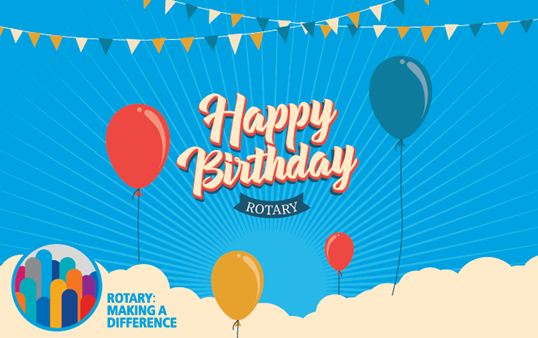 Then please 'share', widely, and let's put a big shout-out to celebrate Rotary's Birthday month. 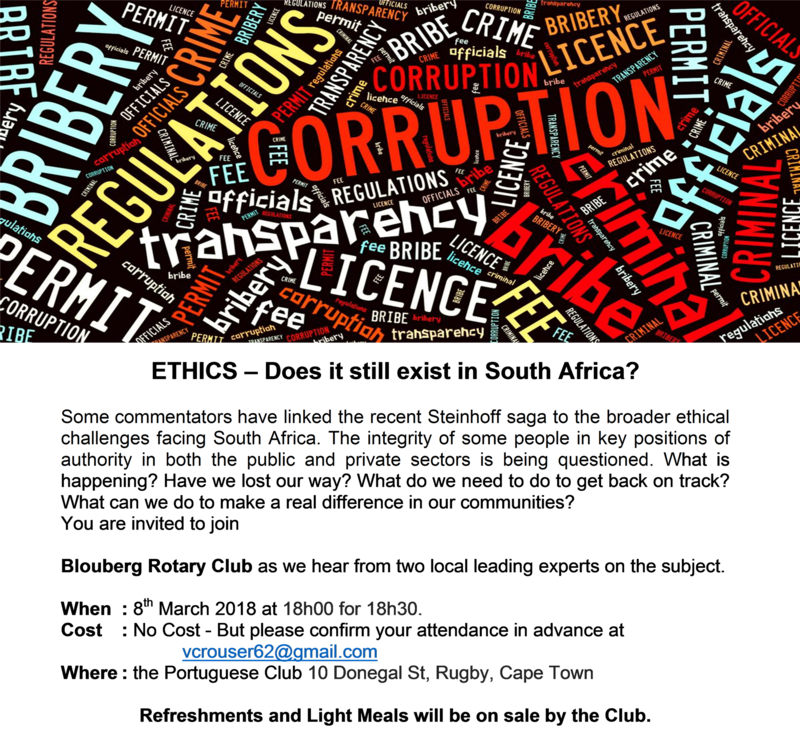 Rotary Club of Wynberg presents Rotary Talks a new premier Talk Event to Cape Town presenting high quality speakers in an evening of inspiration and interest. 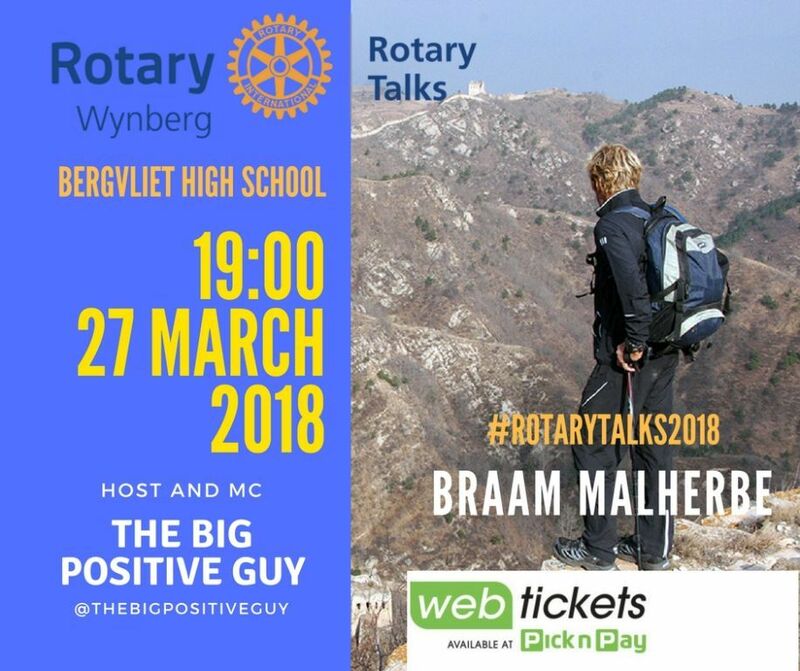 The first Rotary Talks will be Interact with Braam Malherbe the Extreme Adventurer and world renown Keynote Speaker on Tuesday 27 March 2018 at 19H00, at the Bergvliet High School Auditorium. The evening will be hosted by Andre Du Toit better known as the "Big Positive Guy" and Smile FM Presenter. Rotary Talks will be exciting and well worth your evening. Rotary Talks will be a premier Rotary event where Members are able to invite Guests, Prospective Members and promote Rotary. 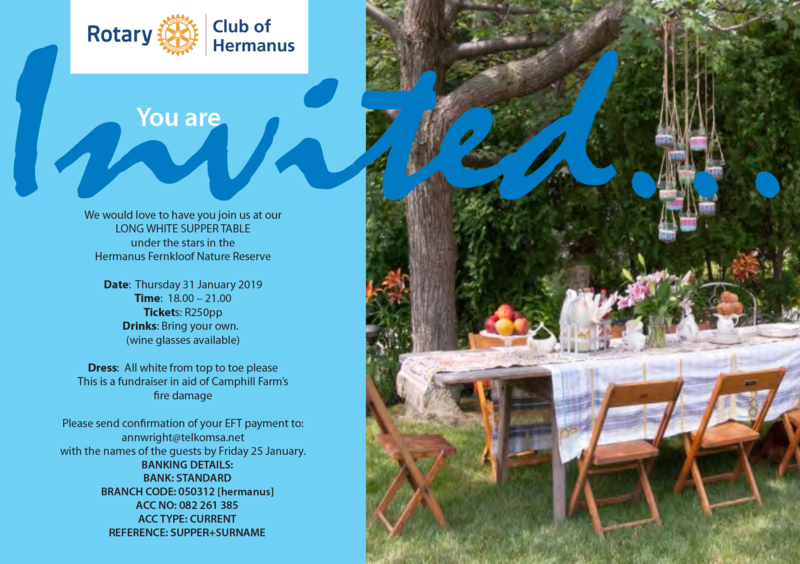 DG Lynette Stassen will address the audience to encourage Volunteerism and promote engagement with Rotary. 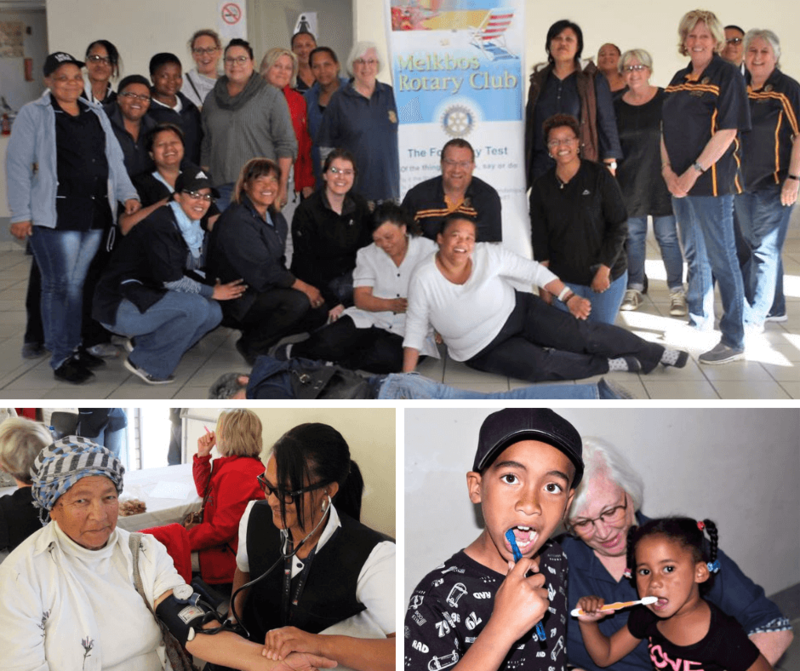 As was done last year, Kromboom Rotary Club teamed up again with the Rotary Clubs of Wynberg and Constantia to host a site for Rotary Family Health Day (RFHD). 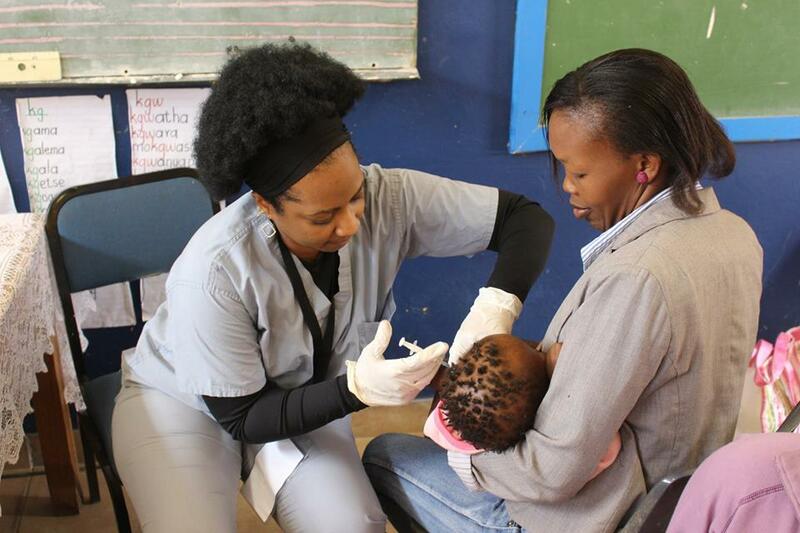 This year the site chosen was the Sozo Foundation in Vrygrond where close to 1000 people were screened over the three day period. 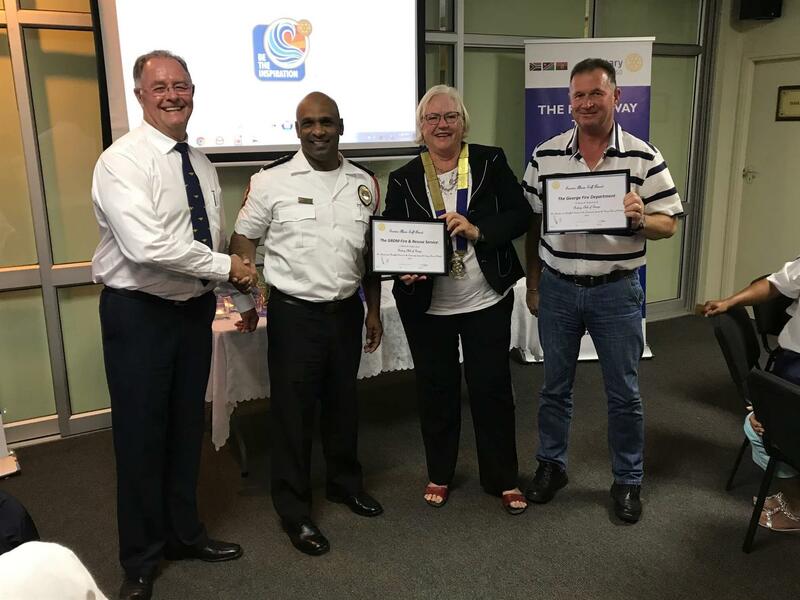 The hard work of giving relief to the Knysna fire victims is ongoing and D9350 is blessed to have President Doug Emanuel; Chair Fire Relief Committee – PP Mick Furman and Admin Fire Relief Committee – PP Sharon Richards taking up this challenge. Thank you! The response to our appeal for funding has been very encouraging and the disbursement of the funds is being handled with the utmost confidentiality and discernment. Actual funds received from donors is R 1 804 622 with more pledged. 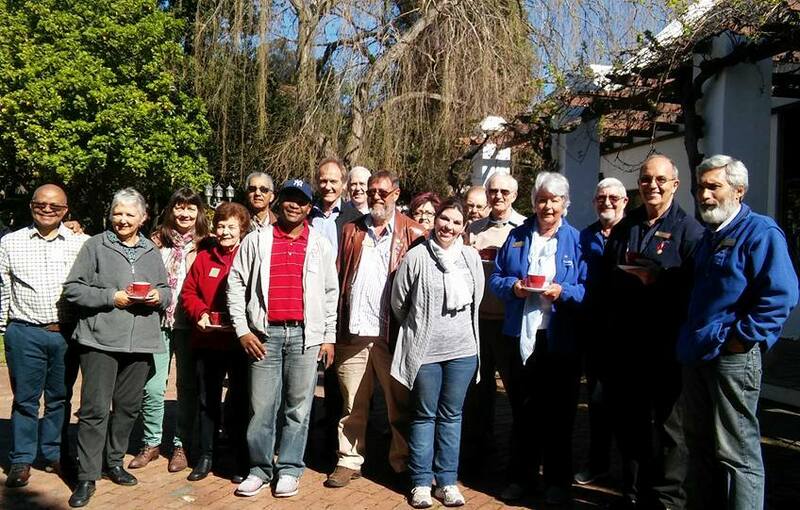 The newly created Environmental Sustainability Committee of D9350, chaired by Lew Botha from the Newlands Club, is there to communicate and interact with clubs. All clubs are keen to get their citation and planting 1 tree for every 1 member in the club as challenged by our RI Pres Ian Riseley will achieve a goal towards humanitarian service and the environment will thank you. 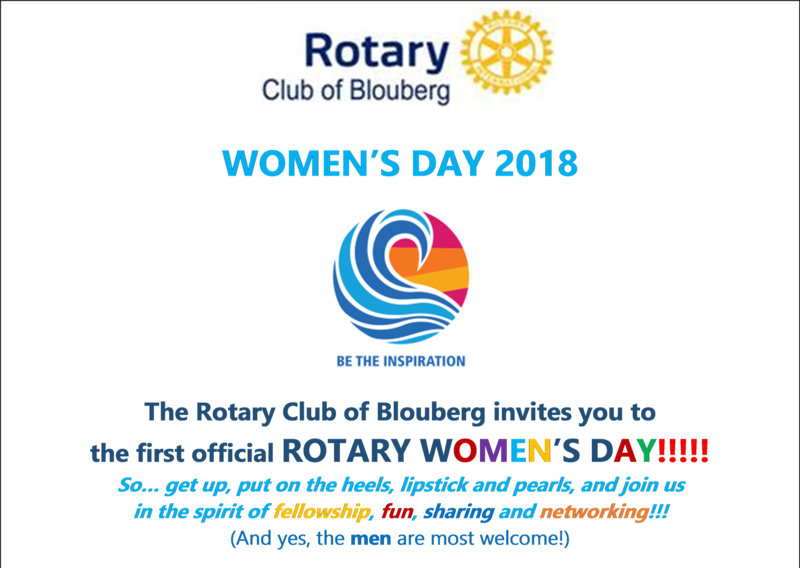 Women’s Day was made extra special by the Claremont Rotary Club with a most generous donation of R20 000 towards readers for our RFHD 2017 sites. President Liz Rose wrote that the club recognises the desperate need for this valuable service to communities and hopes that with this donation more people will be able to receive eye testing and be issued with readers. "When I have a mental picture of the President of a Rotary Club, that person doesn't look like you." How's that for a nerve-wracking opening statement from a major talk-show host? 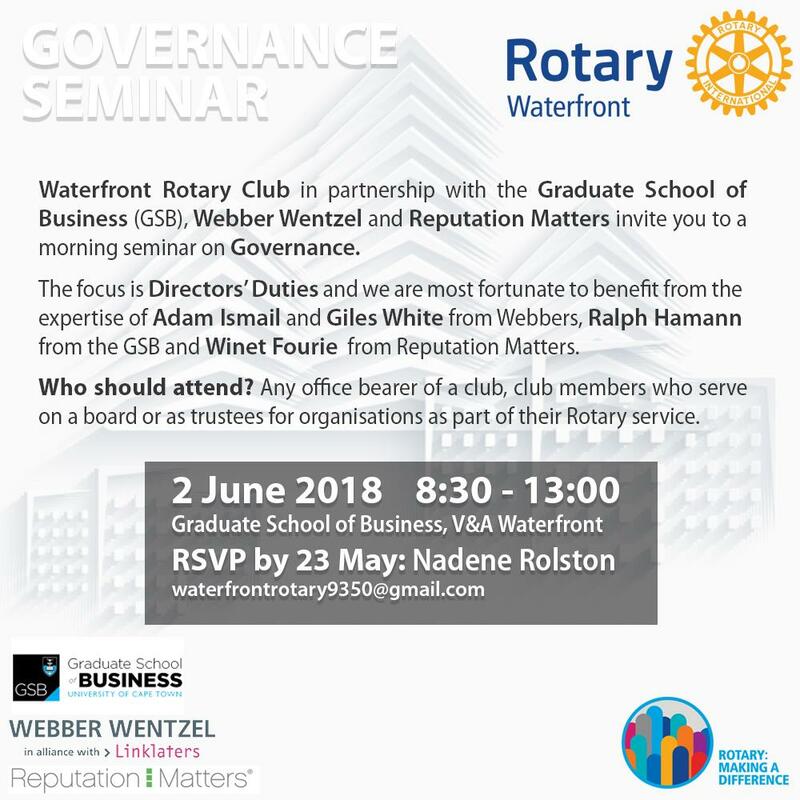 But that's just what Siham Boda, President of Waterfront Rotary, heard as her 'live-on-air' discussion began this afternoon with 567 Cape Talk's John Maythem. Siham elegantly engaged with John's statement and the 12 minute conversation that followed makes for inspiring listening. In fact, the conversation went so well, even the news started late! 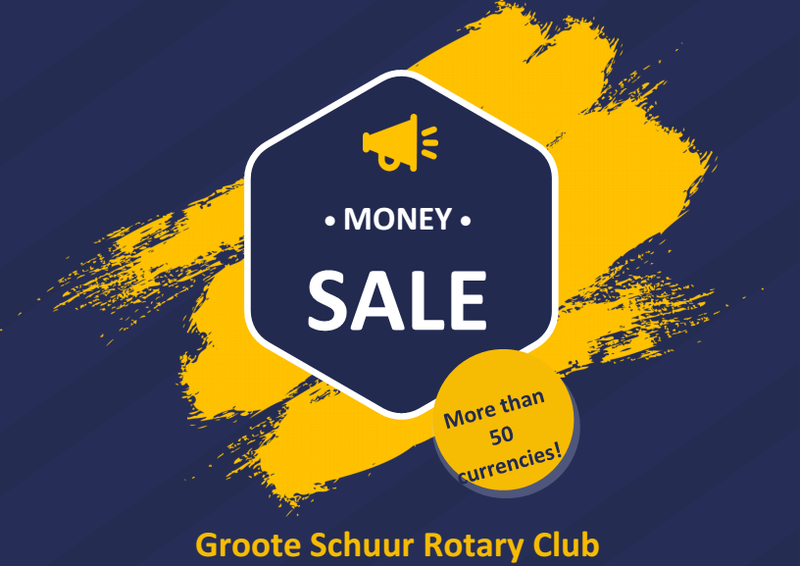 Thanks and very well done, Siham, and thanks President Stephan of Oostenberg for making this happen. I hope you all remember our very long association with HelenLieberman and Ikamva Labantu, because of the Day Care Centre Project etc. We are the Hiking Fellowship of Rotarians and friends-we do a walk/hike each month,and the committee meets the first Wednesday evening also each month. August is Membership and New Club Development Month. How does this connect to The Rotary Foundation? The more Rotarians we have the more resources we have for TRF funding and the more we can do to Make A Difference in our world. 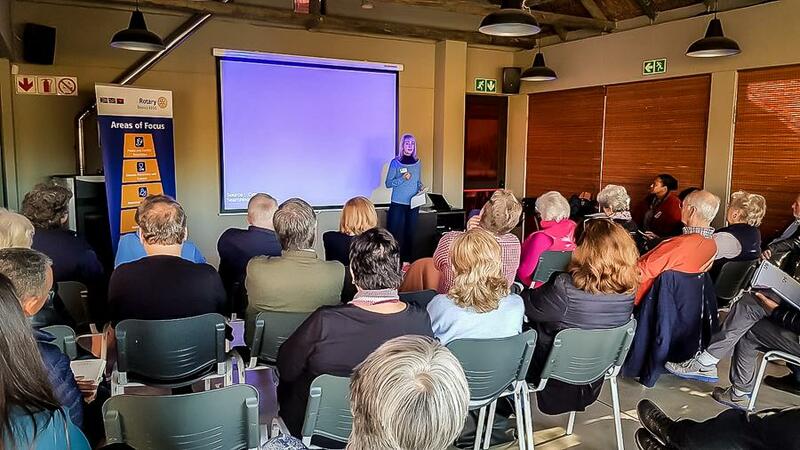 The District Membership Team held the second in the series of Membership Workshops on the 02 Sept 2017 at the Backsberg Wine Estate continuing with the Drive in the District to assist Clubs to increase their Membership. To this end the District has drafted a Membership Strategy for 2017-2020 and are keen to hear how Clubs in the District are managing their Membership Recruitment. Your Ideas and Strategies to both recruit and retain Members can greatly enhance what is being achieved in the District to grow our membership. The Membership Strategy document can be down-loaded from this web-site in the Home Page Download Files block on the left. 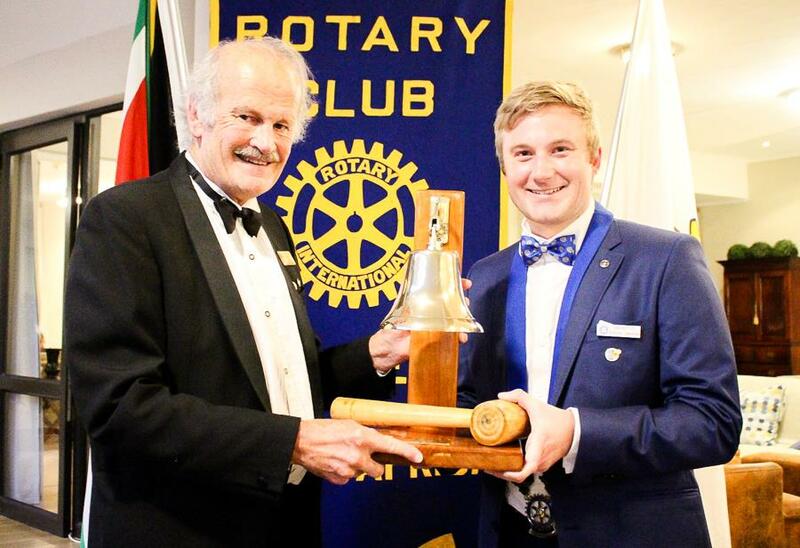 The Rotary Club of Swellendam pulled out all the stops for the District Governor's Gala Dinner with Mayor Nicholas Myburgh setting the scene with an inspiring speech. 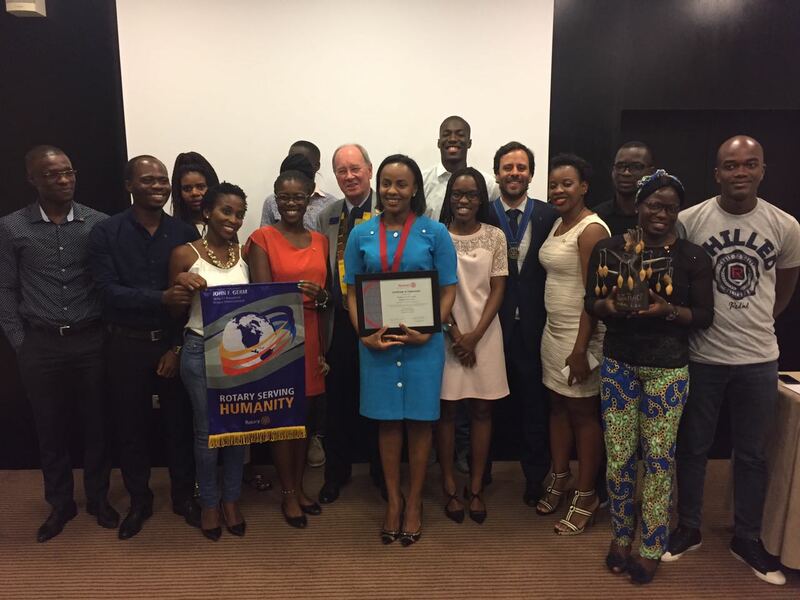 To read the Mayor's speech..
On his recent visit to Clubs in Angola District Governor Ian Pursch inducted President Gracinda da Sousa of the Rotaract Club of Luanda the first to be Chartered in Angola and sponsored by the Rotary Club of Luanda. World’s Outstanding Foundation for 2016! 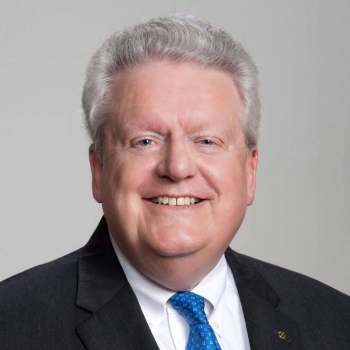 When the Association of Fundraising Professionals (AFP), the US-based professional association of fundraisers, rates The Rotary Foundation (TRF) No 1 in the World, it's worth taking notice. Members of EarlyAct in D9350 raised the bar on their Rotarian counterparts as they spoke with passion and conviction, on Saturday, about their community projects. The opportunity to do so was presented by the EarlyAct Workshop, organised by D9350's Youth Committee with enthusiastic support from D9350 Rotaractors. The Lüderitz Rotary Club has upgraded the Nautilus playground at a cost of N$230 000. 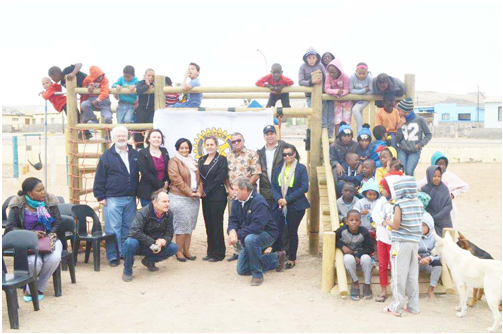 During the recent inauguration of the Nautilus playground President of the Lüderitz Rotary Club Maritz Morgan said this is the eighth playground renovated by the Rotary Club at Lüderitz. 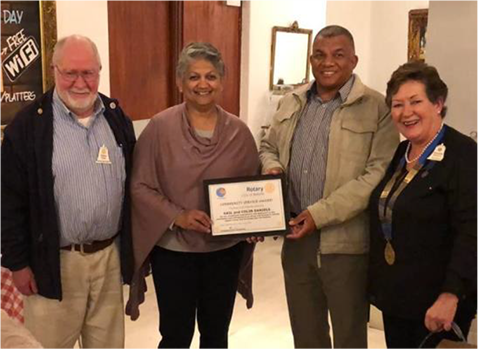 Global Grant #1527314 was recently awarded by The Rotary Foundation to the The Rotary Club of Waterfront for their School Libraries Development Project. The process for securing the above Global Grant (GG) started in 2014. During 2015 this complex process continued requiring considerable work from five RC Waterfront Members. We battled to garner sufficient support from Rotary Clubs, companies and individuals to cover the minimum seed fund of US$ 15 000, and to gather the available District Designated Funds (DDF) contributions. 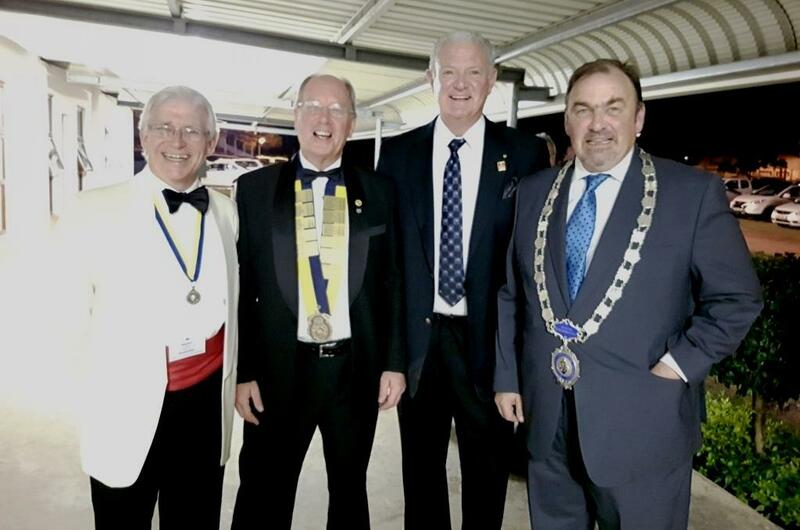 South African and Swedish Rotary Clubs raise funds for the refurbishment of a Dental Clinic for the Community of Nomzamo. Thanks to the multifaceted Partnership the Clinic will now be able to offer a range of dental preventative care, including dental hygiene services and oral hygiene education.